FAIR WARNING: This post is an “all-skate” post. I really want everyone—especially everyone in Jacksonville—to jump in on the comments! So, we shouldn’t be afraid to engage our critics, and although we shouldn’t let them sap our energy or blur our focus, we should be open to learning from them. This past week we’ve gotten a few knocks in the blogosphere, and I wanted to allow you, the readers, to respond to one concern in particular. It’s an important issue, but I can’t answer it all by myself. You see, some (who’ve never visited Access Church or any other North Point Partner) are concerned that we are not “local” enough. 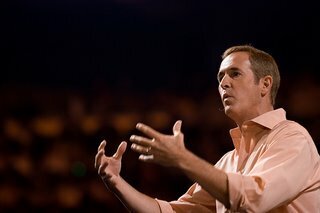 They contend that in order for us to be relevant in Jacksonville, Andy Stanley would have to live in Jacksonville and attend Access Church. These critics maintain that since Andy doesn’t know the “needs of our congregation” he can’t effectively be our teaching pastor. What about other aspects of the church? Do they not have to be “local?” Should we write our own children’s curriculum and groups materials? Should we not read books by authors from outside Jacksonville? What about our worship songs? Tomlin, Crowder, Hillsong…(Australia?! )—scratch them all. Not from our city. Okay, I’ve tipped my hand a bit. You might have figured out which way I’m leaning. Nevertheless, it is an issue we talk about in staff meetings and something we constantly work at. How do we insure that we are a locally functioning body of Christ and not just the latest outpost of a national franchise? I have some thoughts of my own…many of which revolve around the importance we place on groups and strategic service. But this is where I want to hear your thoughts. Jacksonvillians, please—tell us what makes Access “local” to you, and not just a TV church. For our family, our small group and our our kids’ small groups are what really make Access more than “local”. Those things make Access “church” for us. Let’s not forget that there is a local staff who is deciding which messages will be played each week. There is no “message of the week” or “series of the month” that shows up on the doorstep each week for the sound guy to pop in the DVD player. Theres also 12 years of material for the local staff to sift through, pray over, and carefully choose to show. First off, video sermons are such a fraction of what Access is that it is a reach to knock it for not being “local” just based on that. The music, the kids’ programs, the community, the small groups– all of it makes a church what it is. But because there are undoubtedly critics due to the video preaching, I’ll go there… For me, Access is completely local, regardless of if the pastor is 400 miles away or at a pulpit in front of my face… Besides, when we were in Atlanta and attended NPCC, we more often than not sat on the non-live side anyway due to tardiness. Does that mean Andy wasn’t local? Plus, a good message is a good message is a good message. How many times have you heard something great and thought, I wish my (husband, boss, neighbor) was there? Proximity doesn’t make it any less great. Third, let’s be honest, I never knew Andy when I was local. Yes, I ran next to him at the Peachtree Road Race a few years back but I didn’t strike up a conversation and go over my prayer requests (granted that might have made him run faster. Ha!). I guess my point is that it impossible for him to truly know the needs of his congregation. To the critics, that might be a problem of size but again not proximity. For us, small groups and community experienced in serving make our church extremely local.